Well, life must go on. And my life does NOT revolve around the SE forum, hehe! I've just been so busy I haven't had any time to post any blogs much. 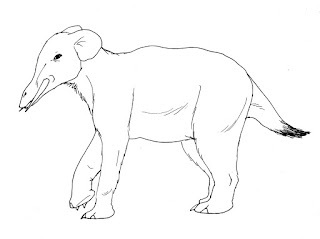 Anyway, Immanids, also known as the "rinkadons", these are large, heavy-set relatives of the therapeds, but they more closely resemble elephants with short trunks. In most species there is an elongated muzzle, tusks, small eyes, large ears, the legs are very much like we see in modern elephants. The tail is short, and in some species even has tassels on the end. They are considerably faster runners than elephants, but cannot jump like the therapeds and other species in this order can. The fur is very fine, they are not naked like modern elephants, but rather has smooth, soft fur, much like we see in rabbits. The ears are like those we see in elephants, and in only one species are as large as those seen in the African elephant, that species is Aequicapistrum, from the USA and Asia. The ears are mostly round on the edges, and somewhat triangular in shape. All species in this family are large, most are well over 7 feet tall. Tusks are present in all species, the largest of which belong to Anthropodonta, in one of the 2 species in this genus, the tusks are longer than the legs, and almost as long as the body. The tongue is long and flexible and acts like the trunk of an elephant to grasp leaf clusters out of trees, or grass and plants from the ground. The feet are short and rounded at the soles and equipped with claw-like hooves they use for defense against predators. The neck is relatively short compared to other trelatebrates, but every bit as flexible. Most of these species are browsers and get most of their food from trees, though they think nothing much of chopping off bushes or gathering plants and other low-growth vegetation. They are strict vegetarians, feeding on many varieties of leaves, grass, plants, flowers, fungi and even fruits, nuts and berries. They cannot hop, but when the need arises, they can rear up on their hind legs to reach higher branches. The short tail is useful at this point for balancing the animal as it is standing, and helps to counterbalance the head when the forelimbs are brought back to Earth, so the weight of the head does not crush the forelimbs. Though the eyes are small, they still have very good eyesight. Their hearing though is their most valuable sense. The sense of smell is no better than our own however. The hearing is ultra-bionic. They can pick up the faintest footfalls from as far as 5000 feet away. Enough time for them to know there is a predator nearby and give them the greatest chance of escape. Sometimes when confronted with a predator, these animals rear-up on their hind limbs and slash with their clawed forelimbs. They can also gore a predator, using their tusks, or by biting. But mostly these animals prefer to run away from danger. The largest species is Immanis, with a full height of about 18 feet. There is no small species, as most of these species are quite large, but the smallest among them is Anthropodonta, with a height reaching about 10 feet. They actually have few predators, but the greatest among their predators are the Deinognathids, particularly Ictocamelus. Large viverrids may also bring them down. The calves are vulnerable to a variety of predators, including large foxes and weasels like Phobogula. Parents are usually pretty good at keeping most predators at bay from their young though. I have a place for this family on my site once I get to it, but I haven't gotten around to doing it just yet. Sometime though. I did a rough sketch of a species in this family and managed to scan it in finally. This is just to give you the viewers an idea of what these animals would look like if you could see one today.